How to Sell Anything to Anyone is the ultimate guide about getting into any business that requires you to do one thing that is to SELL something or product. Its not just about businesses though; even if you are just working for an employee, you are selling your talent and your skills. The best profits come in when you are able to sell things in the right way. 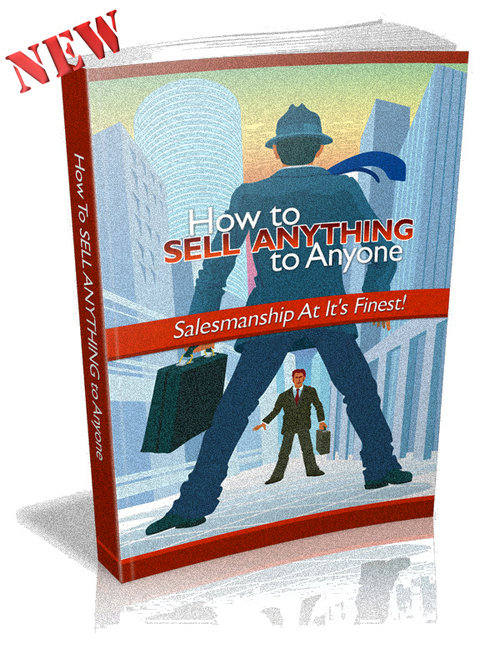 How to Sell Anything to Anyone is the book that will guide anyone how they can do that effectively. - Each article is carefully written by English Native Speakers. - This kind of bundle come with plr. You may edit these products anyway you want. 1. Build a content internet site and set your Google Adsense code into your pages for hands free Adsense cash. 2. Make use of the articles to draw completely new subscribers and clients to opt-in to your list after which you can apply more of the articles to follow-up with consumers and then sell on them. 3. Generate high quality mini digital books that you can plug affiliate links into to make big time affiliate income. 4. Load up your article content in your autoresponder to go out once a week and have a newsletter set for a year upfront. 5. Combine a strong eCourse to your products as a bonus that goes out every week! This will substantially lessen refunds because they want the remainder of the quality eCourse that is ongoing past the refund deadline! 6. Deliver several of the article content as a meaty report that your site visitors can give away to showcase your site. You can also brand it using their links so that they help make affiliate income! 7. Organize the articles into a complete fledged paid product and then sell it for major money! 8. Distribute the articles under your name to the many article directories you can get your hands on and get hoards of traffic, hyperlinks to your web site, and higher search engine ranking.